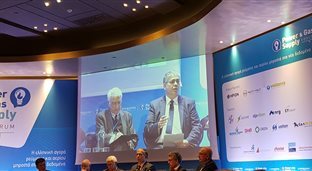 ELPEDISON was Sponsor of the Power & Gas Supply Forum – energypress.gr, which took place on 28th of March at Wyndham Grand Athens. ELPEDISON's CEO, Mr. Nikos Zachariadis, dynamically participated in the 1st section of the Forum, at the round table dedicated to electricity. In his speech, he emphasized the reasons why electricity prices remain high, which are practically related to the over-regulation of the market, leading to a cost burden of at least €40/MWh. In addition, he underlined the main causes for which the electricity market does not open, which mainly lie in the inability to make a firm decision on the future of coal in Greece. Concluding, he added that ELPEDISON was the first company to open new paths in the market and will play a leading role in the team that will guarantee the security energy supply of our country.